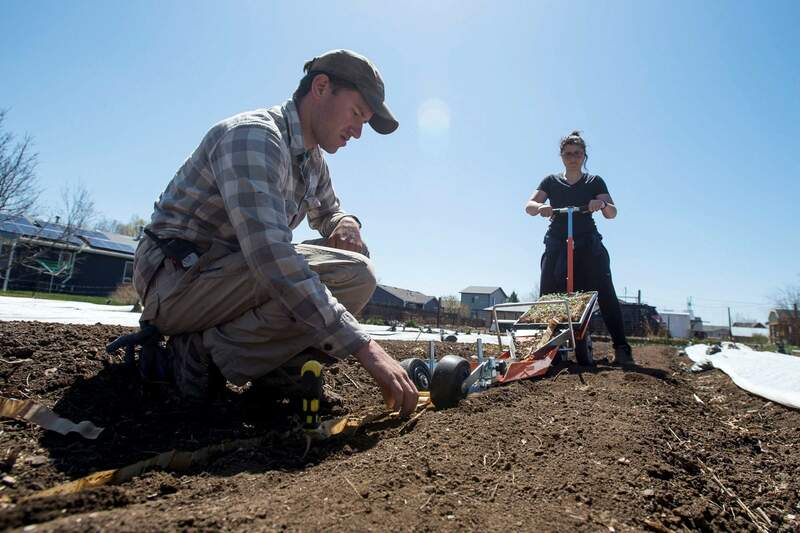 Ben Pfeffer, front, looks on while his apprentice, Hannah Coakley, rolls a Japanese paper pot transplanter down a row at Raisin’ Roots Farm in Fort Collins on April 25. The farm, neighbored by roads and a housing development, could likely fetch a hefty payday from a housing developer, but landowner Dennis Vanderheiden is committed to keeping it urban agriculture. FORT COLLINS (AP) – As farmers toil with crops, chickens and hogs at Raisin’ Roots Farm, cars whiz by at the nearby intersection of Vine Drive and North Taft Hill Road. A housing development borders the Fort Collins property, with eight fenced-in backyards directly facing the farm. The 3-acre space could likely fetch a hefty payday from a housing developer, but landowner Dennis Vanderheiden is committed to keeping it urban agriculture. “It is a little oasis here in the middle of town,” said Vanderheiden, whose family has owned the property since 2009. While the number of Larimer County farms has dwindled in the past decade – often giving way to housing developments – a core of dedicated farmers is driven to be part of the local food scene. After Grant Farms CSA shuttered operations in December and declared bankruptcy in April, there are still about 20 current northern Colorado farms selling directly to the public. Most set up at eight weekly farmers markets scattered throughout Fort Collins, Loveland, Windsor and Wellington. A new monthly Sunday farmers market in Timnath is scheduled to debut in June. Only about 4 percent of all food spending by Colorado residents was at Community Supported Agriculture (CSA) programs and farmers markets, a 2016 study conducted by Colorado Department of Agriculture and Colorado State University found. Still, many local farmers are willing to put in long hours to make thin profit margins. And a number of area farmers say when executed correctly, the hard work yields a comfortable living. The passion for farming comes in various forms. Raisin Roots head farmer Ben Pfeffer discovered his while completing an undergrad thesis about urban farming while at Towson University. He had grown up in a Baltimore suburb that more closely resembled the neighborhood surrounding Raisin Roots than the Vanderheiden-owned land he now lives and works on. The longstanding joke was that Pfeffer’s father didn’t own a single tool. In the peak of summer, Pfeffer will awaken around 4:30 a.m. and put in regular 12- and 14-hour shifts. Raisin Roots sold out of its 50 CSA shares for this season but also sells at farmers markets, to numerous local restaurants and at a roadside stand. Pfeffer’s farmhands share a similar philosophy: Elli Perry is on a break from touring as a musician, and Lily Crane left her San Francisco desk job to work as far away from a computer screen as possible. “You have to be organized and willing to delegate or you will drive yourself into insanity and poverty,” Pfeffer said. Luke Hall had been the maintenance guy at the site of his Shire CSA Farm, 713 E. Prospect Road along the Spring Creek Trail. He later preserved the 3.5-acre lot as urban agriculture and has offered a CSA program since 2009. “The city kind of grew up around the property,” Hall told the Coloradoan in 2016. Ensuring all people have access to local foods is a driving force for many farmers. Most area farmers markets accept SNAP or EBT welfare benefits as payment. Anne Genson took things even further when she launched Sproutin’ Up nine years ago. She had previously been working in low-income neighborhoods as a UCHealth educator. Sproutin’ Up now works closely with Poudre Valley Mobile Home Park, having hired six youths from the neighborhood to their first jobs and offering free markets to the area. Sproutin’ Up also sells regular CSA shares. “I wanted to see if families and kids would eat fresh produce if there were no barriers,” Genson said. As Genson and other local farmers prep for the peak of the growing season, such passion fuels them.